Ian and his friendly staff extend a warm welcome to you all. Everybody loves a quiz. They are just for fun and free to enter. ‘The best food we’ve had on our holiday’ is something we hear a lot. 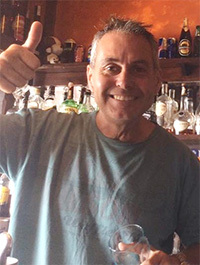 Ian and his friendly staff extend a warm welcome to you all those looking to have some great fun in our English speaking pub in Costa Teguise overlooking the beach. All live sports are covered in Super HD on seven large screens, with Thomman sound system offering clarity & high quality sound and vision. We show all types of sport events in clouding football, Rugby, F1, Golf, Tennis and more, but if ever there is an event you are interested in seeing and its not advertised, just let us know and we will do our best to screen it for you. Young or old, the Dolphin Inn suits everybody. Top quality food and drink awaits you… and why shouldn’t it? You’ve worked hard for your holiday!! We have made great efforts to create a cozy should be cosy and warm traditional English pub atmosphere, perfectly located set overlooking the sea and away from main roads. Our fun bar quizzes, fun being the key word, are extremely popular, always followed by a free raffle. Click on the drop down menus on left of screen from more in depth info and check out some of the photos, or even have a look at our “Whats On” page which shows everything going on this week and can be printed off, or call in and get one when you arrive. See You Soon… the sun, beach and pool are waiting!! About the English Pub and Sports Bar ‘The Dolphin Inn’ in Costa Teguise. 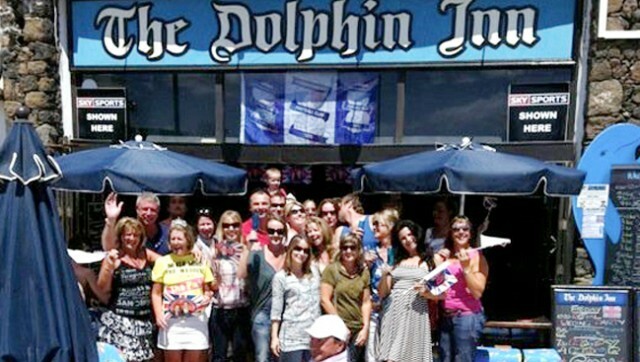 The Dolphin Inn is one of the longest established bars in Costa Teguise, Lanzarote. It is not by luck that we have grown to be one of the most popular English pubs and sports bars in Lanzarote. The secret to our success is due to diligent hard work and giving our customers what they want. At the Dolphin the customer comes first, we make great efforts to give every body that walks in our doors some holiday memories to treasure. Every night and day of the week there is something going on. English breakfasts, lunches and dinners, quiz nights, sporting events and more. The staff are all hand picked for there good manner and serving skill all this is headed up by the owner Ian. He is there most evenings comparing sports events, reading out the questions, joking, laughing and making sure everyone is welcome and having the best of times. Visit us soon at the Dolphin Inn, we are open for Breakfast, Lunch & Dinner every day. Located along the coastal footpath on the southern side of Las Cucharas beach you will find the Dolphin Inn , you can’t miss us! We feature all of the BEST sporting events, GREAT food, and FUN quizzes all in a WELCOMING atmosphere for ALL! 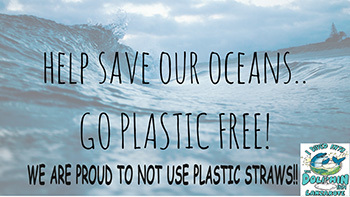 We look forward to seeing you and promise to give you a great time.